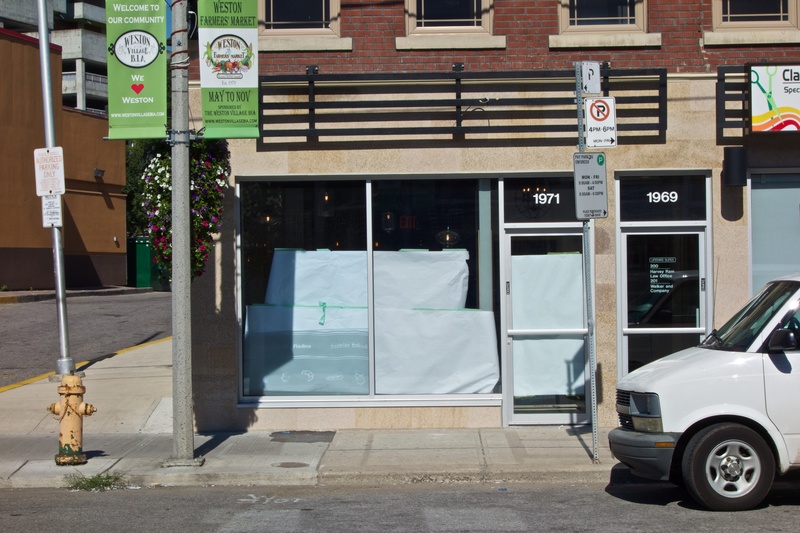 For two years, not a few Westonians have been tormented by the promise of a new coffee shop and bakery coming to our part of the world, namely 1971 Weston Road. Month after month the same view of the exterior with little sign of progress is a bit of a metaphor for what Weston is – lots of promise but no action. The thought of a casual stroll and entering a coffee shop to the smell of coffee and freshly baked croissants has kept me going (sad, I know). 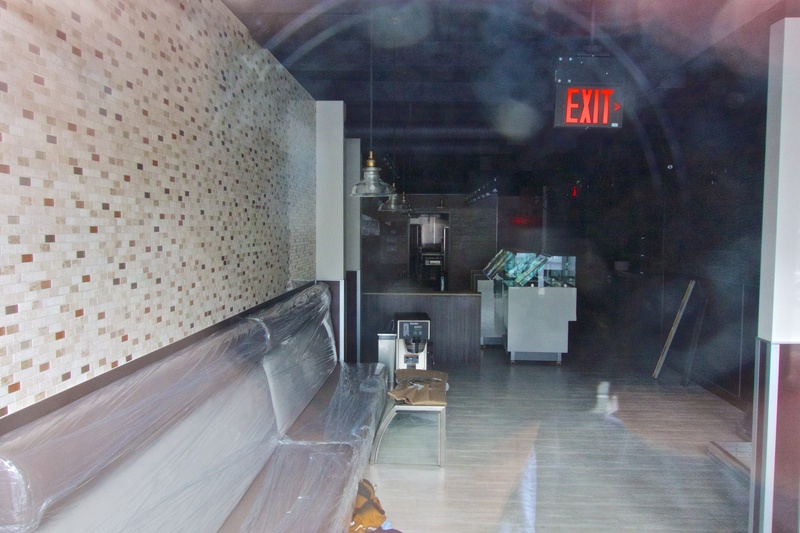 Two years on and while activity seems to have been ongoing inside the shop, little information other than ‘soon’ is forthcoming. Interior view through a gap in the paper. Contrast that with rumours a month ago that a Starbucks was coming to the (almost) neighbourhood. This location at Lawrence and Royal York had previously been the headquarters of the late lamented Blockbuster Video (who saw that coming?). One month later and voila, the place began serving this Wednesday. When WestonWeb visited on Friday the large outlet was occupied with plenty of people checking emails and ordering Starbucks fare. The good news is that it’s only a brisk 16 minute walk to the new Starbucks from Weston and King. One can only hope that this will generate some action at number 1971. If readers have any information about opening dates, please let us know. 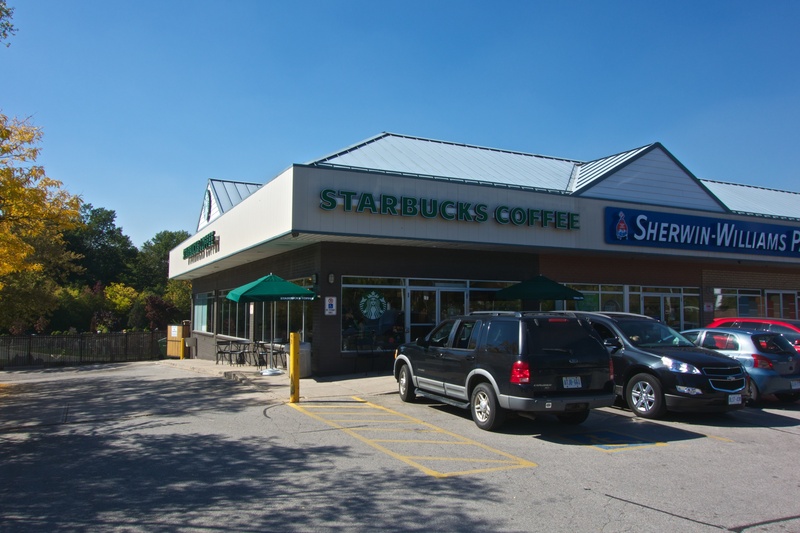 Starbucks located in the more well to do area of Royal York means nothing for Weston. My aim was to draw attention to the lack of progress at 1971 Weston by comparing the two locations in the hope that readers might shed light on the reason for the delay. Looks like Roy lit the fire under the proverbial butts! I read this article this morning and when I walked by Weston Rd at noon the paper was off the windows and a store-front sign was up, “perfect blend”. I then grabbed my friend and we hiked our babies in strollers up the Lawrence Ave hill and rewarded ourselves with iced lattes at Starbucks. While their store is pretty, I never much cared for their coffee and would always prefer to give my money to an independent business. With the hopefully-imminent opening of Perfect Blend I’d would like to hope that the patrons encourage a welcome and diverse atmosphere. Many of the restaurants in Weston that might encourage a leisurely enjoyment of beverages tend to feel less welcoming to individuals from a demographic different than the proprietor… Am I stating that in a politically correct manner? I hope all are welcome and all enjoy. I am anxiously waiting for the perfect blend to open ad well. I am only hoping that when the perfect blend opens there is a diverse clientele, and not idlers patronizing this establishment, that are rowdy and make others feel unwelcome. Every starbucks I’ve ever been to has been filled with idlers, hogging the comfy chairs for hours and playing with phones that are probably smarter than their owners. If patrons behave within civil norms, and proprieters provide good service, that’s as welcome as anyone can expect.